The instructional videos on this website provide the knowledge and demonstrate the tools used to create and customize the district, school and teacher Google Sites Templates provided. The videos are short and focused on specific tasks. The videos are organized in the logical order that will best guide you through the process of creating customizing a great Google Site. For best results you should view the videos sequentially in the order that they are presented on the side bar. As you begin this process you should have a general a road map in mind of what you would like your Site to look like when you have completed your effort. As you watch these short videos you will be able to take the steps demonstrated in each video to make your Site your own. When you've finished viewing all of the instructional videos you will have all the knowledge and tools required to update and change your Site exactly as you need. You'll always be able to go back and re-watch any of the videos as needed to be able to you get your Site exactly how you want it. 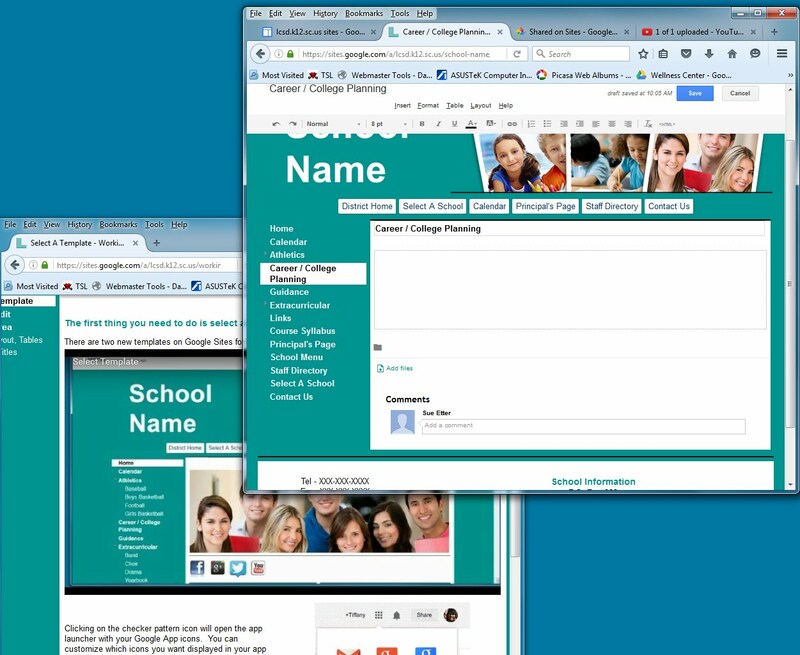 The Sites Templates provided include all of the standard web links needed for your website visitors to move back and forth to and from the District Site to the School Sites to the Teachers Sites. If you leave the Site template exactly as it is, and add your own content to your website template, you will have all the tools needed to create an attractive and useful District, School and / or Teacher Site. However, you can take things farther by customizing your Site with your own images, photos, and much more. If you can set your desktop display up with two active browser windows running so you can watch a video and stop it as needed so that you can then take the steps described in the video and then complete them in your new Site. You should try to organize your text, pictures and images ready upload before you get started. Having these materials prepared, edited and organized in advance will help ease the process of creating your new Site. Good luck and enjoy your new Google Site. It is recommend that you view all of the Instructional Videos in the sequential order the are presented in. Don’t skip around out of order the first time you view them. After viewing all of the videos you can go back and view them in any order you would like. Before you begin customizing your web pages, think about the pages and subjects that you want to include in your Site, as well as the content, words and images that you want on those pages. If you have not used Google Apps before you may want to start by visiting the Google Apps Learning Center to learn about the basics of all of the Google Apps and the power they can provide you.